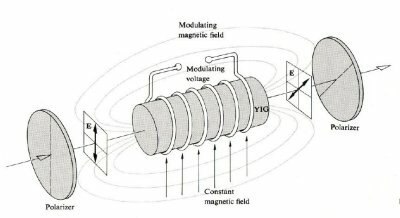 Faraday rotation is a magneto-optic effect, also known as the Faraday effect, in which the plane of polarization of an electromagnetic wave is rotated under the influence of a magnetic field parallel to the direction of propagation. It is named after the English physicist Michael Faraday, who first observed the effect in 1845. The amount of rotation, in radians, is given by Rmλ2, where λ is the wavelength of the radiation and Rm is a factor known as the rotation measure. Faraday rotation is displayed by radio waves as they travel through the interstellar medium. Observing it in the radiation from pulsars is among the most important ways of studying the galactic magnetic field.